For other uses, see Fifth Column (disambiguation). The term was then widely used in Spain. Ernest Hemingway used it as the title of his only play, which he wrote in Madrid while the city was being bombarded, and published in 1938 in his book The Fifth Column and the First Forty-Nine Stories. Though Mola's 1936 usage is widely regarded as the origins of the phrase, historian Christopher Clark quotes a February 1906 letter by Austrian military attaché Joseph Pomiankowski using the phrase, "...the fifth-column work of the [Serbian] Radicals in peacetime, which systematically poisons the attitude of our South Slav population and could, if the worst came to the worst, create very serious difficulties for our army." 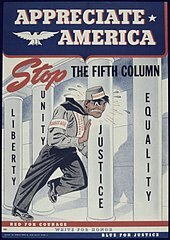 By the late 1930s, as involvement in the war in Europe became more likely, the term "fifth column" was frequently used to warn of potential sedition and disloyalty within the borders of the United States. The fear of betrayal was heightened by the rapid fall of France in 1940, which some blamed on internal weakness and a pro-German "fifth column". A series of photos run in the June 1940 issue of Life magazine warned of "Signs of Nazi Fifth Column Everywhere". In a speech to the House of Commons that same month, Winston Churchill reassured the members that "Parliament has given us the powers to put down Fifth Column activities with a strong hand." In July 1940, Time magazine called fifth column talk a "national phenomenon". In August 1940 the New York Times mentioned "the first spasm of fear engendered by the success of fifth columns in less fortunate countries". One report identified participants in Nazi "fifth columns" as "partisans of authoritarian government everywhere," citing Poland, Czechoslovakia, Norway, and the Netherlands. During the Nazi invasion of Norway, the head of the Norwegian fascist party, Vidkun Quisling, proclaimed the formation of a new fascist government in control of Norway, with himself as Prime Minister, by the end of the first day of fighting. The word "quisling" soon became a byword for "collaborator" or "traitor". John Langdon-Davies, a British journalist who covered the Spanish Civil War, popularized the term "fifth column" by publishing an account called The Fifth Column in 1940. The New York Times published three editorial cartoons that used the term on August 11, 1940. In November 1940, Ralph Thomson, reviewing Harold Lavine's Fifth Column in America, a study of Communist and fascist groups in the U.S., in the New York Times, questioned his choice of that title: "the phrase has been worked so hard that it no longer means much of anything." In the US an Australian radio play, The Enemy Within, proved to be very popular, though this popularity was due to the belief that the stories of fifth column activities were based on real events. In December 1940 the Australian censors had the series banned. British reviewers of Agatha Christie's novel N or M? in 1941 used the term to describe the struggle of two British partisans of the Nazi regime working on its behalf in England during World War II. In Frank Capra's 1941 film Meet John Doe, newspaper editor Henry Connell warns the politically naïve protagonist, John Doe, about a businessman's plans to promote his own political ambitions using the apolitical John Doe Clubs. Connell says to John: "Listen, pal, this fifth-column stuff is pretty rotten, isn't it? ", identifying the businessman with anti-democratic interests in the United States. When Doe agrees, he adds: "And you'd feel like an awful sucker if you found yourself marching right in the middle of it, wouldn't you?" Immediately following the Japanese attack on Pearl Harbor, U.S. Secretary of the Navy Frank Knox issued a statement that "the most effective Fifth Column work of the entire war was done in Hawaii with the exception of Norway." In a column published in the Washington Post, dated 12 February 1942, highly respected columnist Walter Lippmann wrote of imminent danger from actions that might be taken by Japanese Americans. Titled "The Fifth Column on the Coast," he wrote of possible attacks that could be made along the on the West Coast of America that would amplify damage inflicted by a potential attack by Japanese naval and air forces. Suspicion about an active fifth column on the coast led eventually to the forced internment of Japanese Americans. During the Japanese invasion of the Philippines, an article in the Pittsburgh Post-Gazette in December 1941 said the indigenous Moro Muslims were "capable of dealing with Japanese fifth columnists and invaders alike". Another in the Vancouver Sun the next month described how the large population of Japanese immigrants in Davao in the Philippines welcomed the invasion: "the first assault on Davao was aided by numbers of Fifth Columnists–residents of the town". Alfred Hitchcock's Saboteur features Robert Cummings asking for help against "fifth columnists" conspiring to sabotage the American war effort. Soon the term was being used in popular U.S. entertainment. Cartoons of Porky Pig asked any "fifth columnists" in the audience to leave the theater immediately. In Looney Tunes' Foney Fables, the narrator of a comic fairy tale described a wolf in sheep's clothing as a "fifth columnist". There was even a Merrie Melodies series that ran in 1943 titled The Fifth-Column Mouse. Comic books also contained references to the Fifth column. Graham Greene, in The Quiet American (1955) famously uses the phrase, "Fifth Column, Third Force, Seventh Day" in the second chapter. German minority organizations in Czechoslovakia formed the Sudeten German Free Corps, which aided the Third Reich. Some claimed they were "self-defense formations" created in the aftermath of World War I and unrelated to the German invasion two decades later. More often their origins were discounted and they were defined by the role they played in 1938–39: "The same pattern was repeated in Czechoslovakia. Henlein's Free Corps played in that country the part of fifth column". In 1945, a document produced by the U.S. Department of State compared the earlier efforts of Nazi Germany to mobilize the support of sympathizers in foreign nations to the superior efforts of the international communist movement at the end of World War II: "a communist party was in fact a fifth column as much as any [German] Bund group, except that the latter were crude and ineffective in comparison with the Communists". Arthur M. Schlesinger, Jr., wrote in 1949: "the special Soviet advantage—the warhead—lies in the fifth column; and the fifth column is based on the local Communist parties". North Koreans living in Japan, particularly those affiliated with the organization Chongryun (which is itself affiliated with the government of North Korea) are sometimes seen as a "fifth column" by some Japanese, and have been the victims of verbal and physical attacks. These have occurred more frequently since the government of Kim Jong Il acknowledged it had abducted people from Japan and tested ballistic missiles. Some Israeli Jews, including politicians, rabbis, journalists, and historians, who believe that Israeli Arabs identify more with the Palestinian cause than with the state of Israel or Zionism, have referred to them, who compose approximately 20% of Israel's population, as a fifth column. Counter-jihad literature has sought to portray Western Muslims as a "fifth column", collectively seeking to destabilize Western nations' identity and values for the benefit of an international Islamic movement intent on the establishment of a caliphate in Western countries. Following the 2015 attack by French-born Muslims on the offices of Charlie Hebdo in Paris, the leader of the UK Independence Party Nigel Farage said that Europe had "a fifth column living within our own countries". In 2001 Dutch politician Pim Fortuyn talked about Muslim immigrants being a "fifth column" the night he was dismissed as leader of Liveable Netherlands. The term was frequently used by some Russian media during 2014 pro-Russian unrest in Ukraine to describe any form of criticism of Russian policy in Ukraine. Aleksandr Dugin came up with a concept of "sixth column" describing those members of Russian elite who do not demonstrate sufficient enthusiasm in supporting the official policy and thus indirectly support the enemy. ^ Madeleine Albright, for example, in a lengthy account of German sympathizers in Czechoslovakia in the first years of World War II, does not use the phrase to describe their actions until she considers their possible response to a German invasion: "Many, perhaps most, of the Sudetens would have provided the enemy with a fifth column". ^ Holland, James. The Battle of Britain: Five Months That Changed History; May–October 1940. ISBN 9780312675004. ^ "The Fifth Column and Forty-Nine Stories". The Literary Encyclopedia. Retrieved June 24, 2010. ^ M.,, Clark, Christopher. The Sleepwalkers : How Europe Went to War in 1914 (First U.S. ed.). New York. p. 58. ISBN 9780061146657. OCLC 795757585. ^ Günther., Kronenbitter, (2003). "Krieg im Frieden" : die Führung der k.u.k. Armee und die Grossmachtpolitik Österreich-Ungarns 1906-1914. München: Oldenbourg. p. 327. ISBN 3486567004. OCLC 53805594. ^ Albright, Madeleine (2012). Prague Winter: A Personal Story of Remembrance and War, 1937-1948. NY: HarperCollins. p. 102. ^ "We Shall Fight on the Beaches". winstonchurchill.org. Retrieved July 25, 2017. ^ The New York Times: Delbert Clark, "Aliens to Begin Registering Tuesday," August 25, 1940. Retrieved June 27, 2012. ^ Polish Ministry of Information (2014). The German Fifth Column in Poland. Washington, D.C.: Dale Street Books. pp. 3–6. ISBN 9781941656099. ^ Tolischus, Otto D. (June 16, 1940). "How Hitler Made Ready: I - The Fifth Column" (PDF). The New York Times. Retrieved July 7, 2012. ^ Barkley, Frederick R. (August 11, 1940). "Nation Shapes Defense against Foes at Home" (PDF). The New York Times. Retrieved July 7, 2012. ^ Thomson, Ralph (November 27, 1940). "Books of the Times" (PDF). The New York Times. Retrieved April 25, 2015. ^ Loeffel, Robert (2015). The Fifth Column in World War II: Suspected Subversives in the Pacific War and Australia. Palgrave. p. 85. ^ Niiya, Brian. "Frank Knox". Densho Encyclopedia. Retrieved August 27, 2014. ^ Niiya, Brian. "The Fifth Column on the Coast". Densho Encyclopedia. Retrieved August 27, 2014. ^ "80 Japanese Troop Ships Are Sighted Off Luzon (Continued From Page1)". Pittsburgh Post-Gazette. December 22, 1941. p. 7. Retrieved October 30, 2014. ^ Curtis, Herbert (January 13, 1942). "Japanese Infiltration Into Mindanao". Vancouver Sun. p. 4. Retrieved October 30, 2014. ^ Goodnow, Trischa. The 10 Cent War: Comic Books, Propaganda, and World War II. ^ Bordelon, Brendan (January 7, 2015). "UKIP's Farage: Multiculturalism Creating 'Fifth Column' in West". National Review. Retrieved January 8, 2015. ^ "Fortuyn: ramp voor politiek en vaderland" (in Dutch). ^ Александр Дугин (May 21, 2014). За Ахметова грудью встала российская шестая колонна. Nakanune.ru (in Russian). The German Fifth Column in Poland. London: Polish Ministry of Info. 1941. Bilek, Bohumil (1945). Fifth Column at Work. London: Trinity. Loeffel, Robert (2015). The Fifth Column in World War II: Suspected Subversives in the Pacific War and Australia. Palgrave.